A brilliant compere, host and stand-up, as well of course as an actress, she has used her combined talents to perform three one-woman shows in Edinburgh, London and Sydney with the brilliant titles of I Might Be Single - but The Voices Keep Me Company , Some of My Best Friends are Ginger and "I'm In Love with the Singer from Pulp. 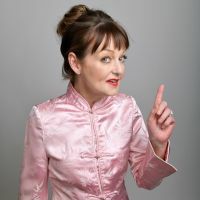 Also as an actress, Mandy Knight appeared as one of the main characters in Jo Brand's popular TV series Like it or Lump it and worked with David Baddiel on his series The Baddiel Syndrome. Other television credits include hosting Live Time, a magazine type show a la Richard and Judy but without the smugness or falling out breasts, where she held riveting interviews with people about things like National Cheese Week. Mandy Knight has also written for various other television shows, including another smug pair in Des and Mel and appeared on The Little Big Woman Radio Show.